I wanted to experiment with simple low-cost DC motors and see how easy it would be to make my own 3D designs to convert their high speed, low torque attributes into something more usable. So I designed this gear experiment set that lets you position and fix various gear sizes onto a matrix board. You can then drive the input with a commonly available DC motor or a crank handle option. I added a linear piston as an output device and also a spinning thing, but this is just a bit of a novelty. All of them have a 10mm inner spindle gear. The 8 x 8 cm matrix boards have M3 holes space at 5mm. Use M3 x 20mm screws to hold the gears in place. I did try printing some 3mm pins for this but they are not so easy to print and were too weak. You can also print the stand-off feet the raise up the matrix boards to give space underneath for any excess screw length or if you want to secure them with a 3mm nut. There is an option to fix the motor both horizontally with a bevel gears or vertically. In use, it can be a bit temperamental and may jam up sometimes, but that’s part of the fun in getting it going. The m3 screws can sometime tighten themselves if it’s running fast gear can pop off so there could be secured with double M3 nuts. I’ve created recesses in the latest gear design to accommodate the screw heads. Screws of 25mm or longer may be used it necessary. Tip: Only drive the out rings from other outer rings or the 10mm inner rings. It needs too much torque if you try to drive the 10mm inner ring from a larger outer ring. The matrix boards seem to take forever to slice. I use Slic3r and it has to be left for hours! PowerBox.stl - Holds the batteries and DC motor controller. LinearPistonPins.stl - Pins to connect the conrod and piston together. The gears. Print as needed. the medium to large sizes are more useful. These are a later design. 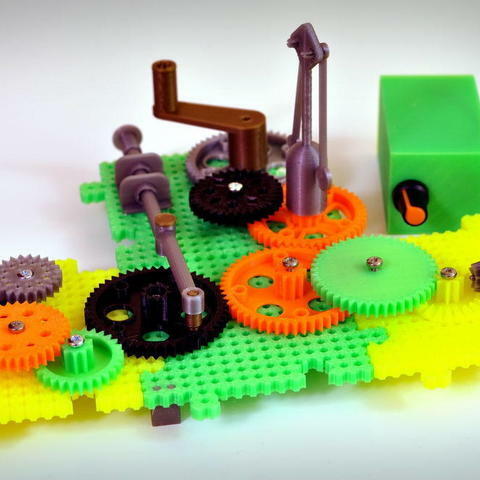 the images show some plain green gears but I updated them to look more interesting. Everything is designed to print without supports. Standard infill of around 20% is normally fine, but you can increase if necessary.